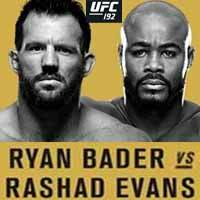 Review by AllTheBestFights.com: 2015-10-03, fight not particularly exciting between Rashad Evans and Ryan Bader: it gets two stars. The black belt in no-gi Bjj and Gaidojutsu and former Ufc light-Hw champion Rashad Evans entered this fight with a mma record of 19-3-1 (47% finishing rate) but he is not ranked as he hasn’t fought since November 16, 2013 when he defeated Chael Sonnen (=Evans vs Sonnen). His opponent, the Tuf 8 winner Ryan Bader, has an official record of 19-4-0 (53% finishing rate) and he entered as the No.4 light heavyweight in the world. He suffered his last loss in 2013 when he faced Glover Teixeira (=Teixeira vs Bader), since then he has won four consecutive fights beating Phil Davis in his last one (=Davis vs Bader). Evans vs Bader, light heavyweight title eliminator, is on the undercard of Daniel Cormier vs Alexander Gustafsson – UFC 192. Watch the video and rate this fight!